Emulated devices are purely virtual devices that mimic real hardware, allowing unmodified guest operating systems to work with them using their standard in-box drivers. Virtio devices (also known as paravirtualized) are purely virtual devices designed to work optimally in a virtual machine. Virtio devices are similar to emulated devices, but non-Linux virtual machines do not include the drivers they require by default. Virtualization management software like the Virtual Machine Manager (virt-manager) and the Red Hat Virtualization Hypervisor install these drivers automatically for supported non-Linux guest operating systems. Red Hat Enterprise Linux 7 supports up to 216 virtio devices. For more information, see Chapter 5, KVM Paravirtualized (virtio) Drivers. Assigned devices are physical devices that are exposed to the virtual machine. This method is also known as passthrough. Device assignment allows virtual machines exclusive access to PCI devices for a range of tasks, and allows PCI devices to appear and behave as if they were physically attached to the guest operating system. Red Hat Enterprise Linux 7 supports up to 32 assigned devices per virtual machine. Device assignment is supported on PCIe devices, including select graphics devices. Parallel PCI devices may be supported as assigned devices, but they have severe limitations due to security and system configuration conflicts. Red Hat Enterprise Linux 7 supports PCI hot plug of devices exposed as single-function slots to the virtual machine. Single-function host devices and individual functions of multi-function host devices may be configured to enable this. Configurations exposing devices as multi-function PCI slots to the virtual machine are recommended only for non-hotplug applications. For more information on specific devices and related limitations, see Section 23.18, “Devices”. PCI device assignment is only available on hardware platforms supporting either Intel VT-d or AMD IOMMU. These Intel VT-d or AMD IOMMU specifications must be enabled in the host BIOS for PCI device assignment to function. The Intel VT-d specifications provide hardware support for directly assigning a physical device to a virtual machine. These specifications are required to use PCI device assignment with Red Hat Enterprise Linux. The Intel VT-d specifications must be enabled in the BIOS. Some system manufacturers disable these specifications by default. The terms used to see these specifications can differ between manufacturers; consult your system manufacturer's documentation for the appropriate terms. Activate Intel VT-d in the kernel by adding the intel_iommu=on and iommu=pt parameters to the end of the GRUB_CMDLINX_LINUX line, within the quotes, in the /etc/sysconfig/grub file. The example below is a modified grub file with Intel VT-d activated. rhcrashkernel-param || :) rhgb quiet intel_iommu=on iommu=pt"
Note that if you are using a UEFI-based host, the target file should be /etc/grub2-efi.cfg. Reboot the system to enable the changes. Your system is now capable of PCI device assignment. The AMD IOMMU specifications are required to use PCI device assignment in Red Hat Enterprise Linux. These specifications must be enabled in the BIOS. Some system manufacturers disable these specifications by default. Append amd_iommu=pt to the end of the GRUB_CMDLINX_LINUX line, within the quotes, in /etc/sysconfig/grub so that AMD IOMMU specifications are enabled at boot. For further information on IOMMU, see Appendix E, Working with IOMMU Groups. These steps cover assigning a PCI device to a virtual machine on a KVM hypervisor. 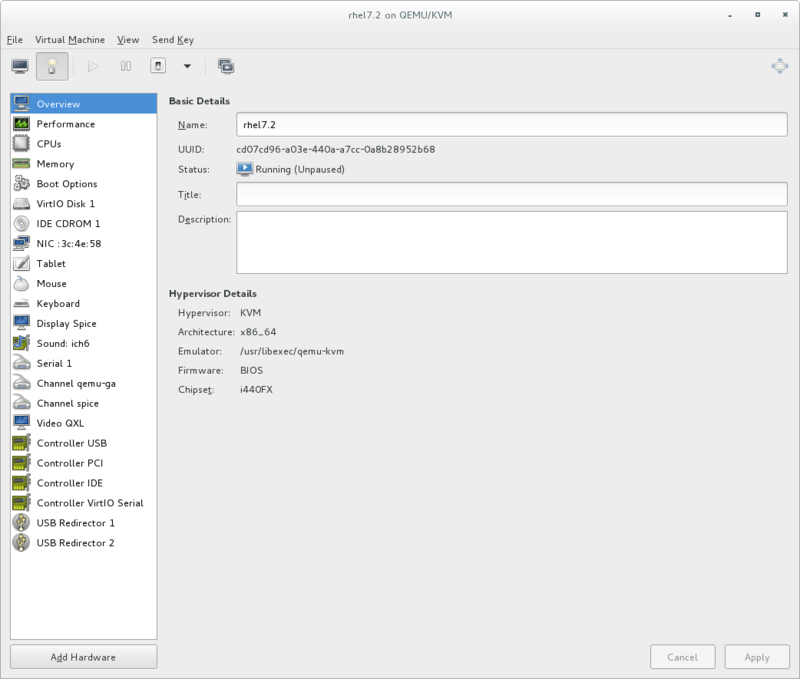 This example uses a PCIe network controller with the PCI identifier code, pci_0000_01_00_0, and a fully virtualized guest machine named guest1-rhel7-64. First, identify the PCI device designated for device assignment to the virtual machine. Use the lspci command to list the available PCI devices. You can refine the output of lspci with grep. This Ethernet controller is shown with the short identifier 00:19.0. We need to find out the full identifier used by virsh in order to assign this PCI device to a virtual machine. To do so, use the virsh nodedev-list command to list all devices of a particular type (pci) that are attached to the host machine. Then look at the output for the string that maps to the short identifier of the device you wish to use. This example shows the string that maps to the Ethernet controller with the short identifier 00:19.0. Note that the : and . characters are replaced with underscores in the full identifier. Record the PCI device number that maps to the device you want to use; this is required in other steps. An IOMMU group is determined based on the visibility and isolation of devices from the perspective of the IOMMU. Each IOMMU group may contain one or more devices. When multiple devices are present, all endpoints within the IOMMU group must be claimed for any device within the group to be assigned to a guest. This can be accomplished either by also assigning the extra endpoints to the guest or by detaching them from the host driver using virsh nodedev-detach. Devices contained within a single group may not be split between multiple guests or split between host and guest. Non-endpoint devices such as PCIe root ports, switch ports, and bridges should not be detached from the host drivers and will not interfere with assignment of endpoints. See the output from the virsh nodedev-dumpxml pci_0000_00_19_0 command for the values required for the configuration file. Run virsh edit, specifying the virtual machine name, and add a device entry in the <source> section to assign the PCI device to the guest virtual machine. The PCI device should now be successfully assigned to the virtual machine, and accessible to the guest operating system. PCI devices can be added to guest virtual machines using the graphical virt-manager tool. The following procedure adds a Gigabit Ethernet controller to a guest virtual machine. Open the guest virtual machine and click the Add Hardware button to add a new device to the virtual machine. 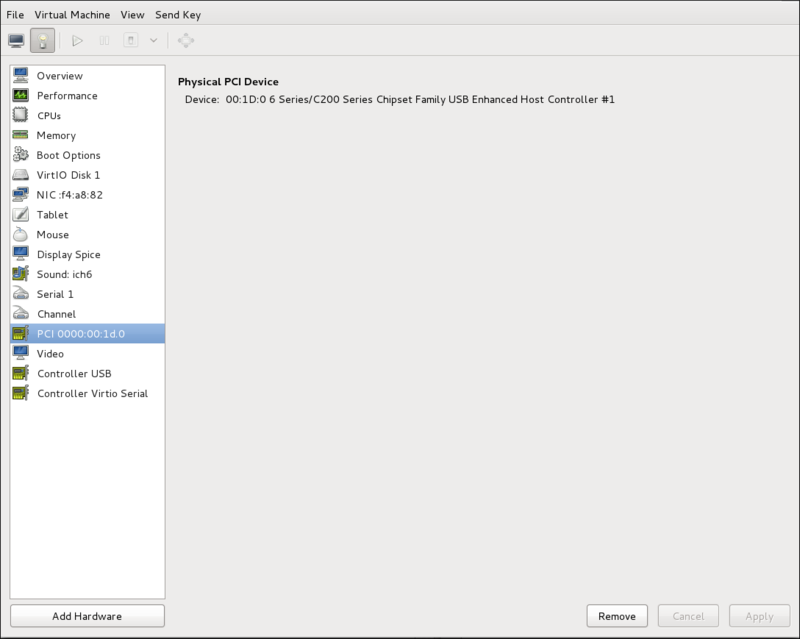 Select PCI Host Device from the Hardware list on the left. Select an unused PCI device. Note that selecting PCI devices presently in use by another guest causes errors. In this example, a spare audio controller is used. Click Finish to complete setup. The setup is complete and the guest virtual machine now has direct access to the PCI device. If device assignment fails, there may be other endpoints in the same IOMMU group that are still attached to the host. There is no way to retrieve group information using virt-manager, but virsh commands can be used to analyze the bounds of the IOMMU group and if necessary sequester devices. See the Note in Section 16.1.1, “Assigning a PCI Device with virsh” for more information on IOMMU groups and how to detach endpoint devices using virsh. It is possible to assign a PCI device when installing a guest using the virt-install command. To do this, use the --host-device parameter. Identify the PCI device designated for device assignment to the guest virtual machine. See the Note in Section 16.1.1, “Assigning a PCI Device with virsh” for more information on IOMMU groups. When a host PCI device has been assigned to a guest machine, the host can no longer use the device. If the PCI device is in managed mode (configured using the managed='yes' parameter in the domain XML file), it attaches to the guest machine and detaches from the guest machine and re-attaches to the host machine as necessary. If the PCI device is not in managed mode, you can detach the PCI device from the guest machine and re-attach it using virsh or virt-manager. If the device is in managed mode, skip this step. The device will be returned to the host automatically. The device is now available for host use. In virt-manager, double-click the virtual machine that contains the device. 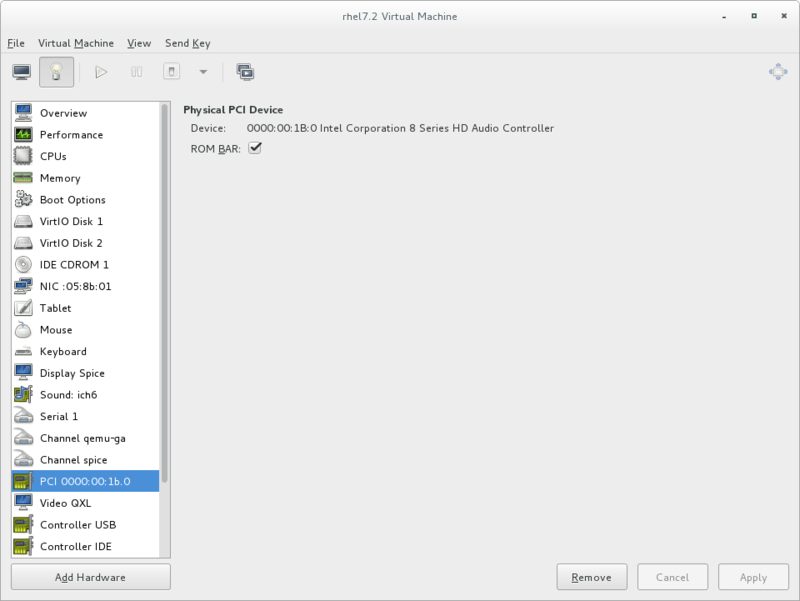 Select the Show virtual hardware details button to display a list of virtual hardware. 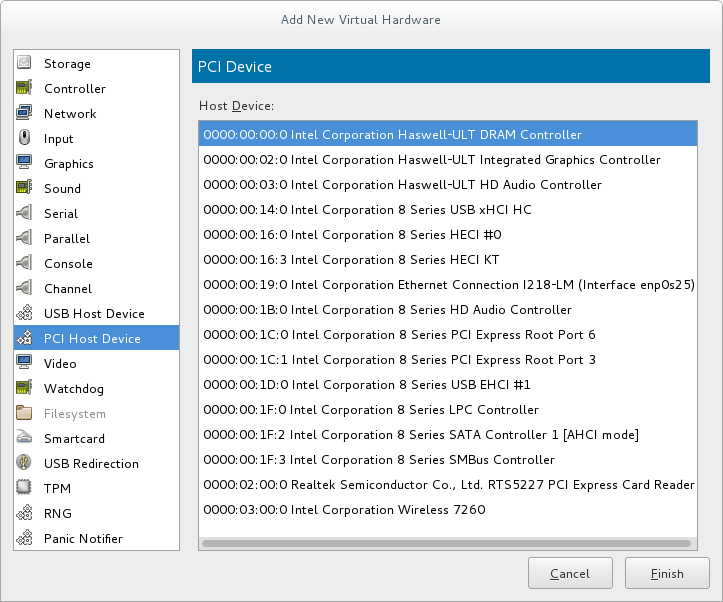 Select the PCI device to be detached from the list of virtual devices in the left panel. Click the Remove button to confirm. The device is now available for host use. Peripheral Component Interconnects (PCI) bridges are used to attach to devices such as network cards, modems and sound cards. Just like their physical counterparts, virtual devices can also be attached to a PCI Bridge. In the past, only 31 PCI devices could be added to any guest virtual machine. Now, when a 31st PCI device is added, a PCI bridge is automatically placed in the 31st slot moving the additional PCI device to the PCI bridge. Each PCI bridge has 31 slots for 31 additional devices, all of which can be bridges. In this manner, over 900 devices can be available for guest virtual machines. Note that this action cannot be performed when the guest virtual machine is running. You must add the PCI device on a guest virtual machine that is shutdown. PCI device assignment (attaching PCI devices to virtual machines) requires host systems to have AMD IOMMU or Intel VT-d support to enable device assignment of PCIe devices. Red Hat Enterprise Linux 7 has limited PCI configuration space access by guest device drivers. This limitation could cause drivers that are dependent on device capabilities or features present in the extended PCI configuration space, to fail configuration. There is a limit of 32 total assigned devices per Red Hat Enterprise Linux 7 virtual machine. This translates to 32 total PCI functions, regardless of the number of PCI bridges present in the virtual machine or how those functions are combined to create multi-function slots.